Just turn up 10 minutes early to secure a spot. A hatha-based flow class with a combination of dynamic and calming sequences. A balanced combination of sustained poses (Hatha) as well as poses flowing in a mindful progression from one to another. Attention is always given to basic alignment and therapeutic principles. Mindfulness; observing breath and body, is an integral part of the class. Classes are balanced so as to give you a good physical work out, and calmness to keep you balanced. A gentle-paced, hatha-based flow class. Asanas are practices at a slower pace and the transitions between poses is a little slower. Mindfulness; observing breath and body, is an integral part of class. The more gentle nature of this class is great also for beginners, but is also wonderful for experienced students who feel like slowing it down and sinking deeper into their practice. A floor-based meditative style of yoga where poses are held for longer periods of time. Yin yoga targets the connective tissue (ligament, tendons and fascia) to help improve flexibility and create the feeling of freedom in your body and stillness in the mind. You will leave feeling amazing. These classes are suitable for all levels of students. This is a great class for those with limited movementfind or seniors. This class incorporates hatha-based asanas, breath work meditation and relaxation. A grounding, therapeutic class that will leave you feeling amazing. Our Mindful Yogi classes are incredibly nourishing and grounding. You will work on relaxation techniques, breathing exercises and a guided meditation based on mindfulness. The class concludes with a grounding yoga nidra (yogi sleep) and a long peaceful savasana. Pure bliss! These classes are suitable for all levels of students. Our aim at The Studio is to create a safe welcoming space for you to practice yoga. The Beginners’ Course is designed to teach you everything about the basic yoga poses. 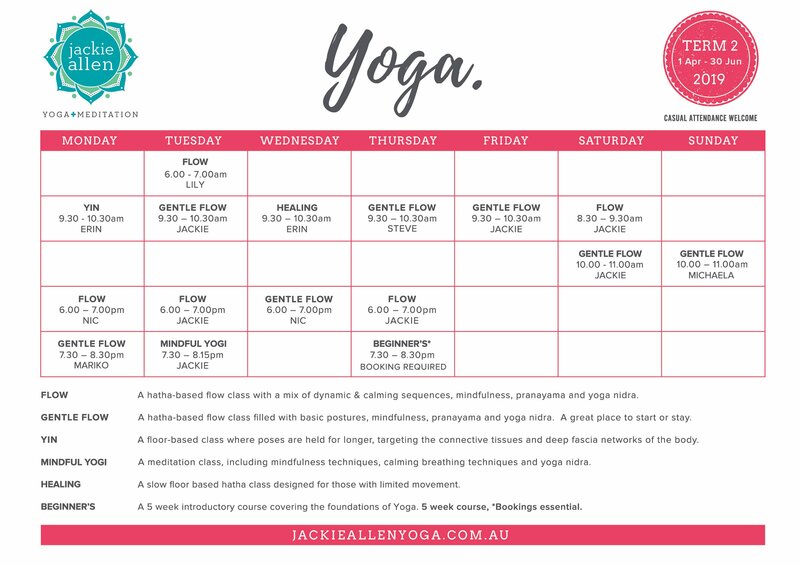 You will also learn breathing practices, mindfulness and relaxation techniques led by Jackie Allen. We oly allow 10 people in this course, so that everyone can get lots of help. We understand that not every body is the same, and a yoga pose that suits one person may not suit the next. This class is designed to work closely with individuals to find the best posture to suit your personal body type so you can enjoy working within safe parameters. There is no one size fits all. As we limit this class to a small number of people, this course books out quickly. If you wish to be notified of the next course coming up please email info@jackieallenyoga.com.auto and register your interest.